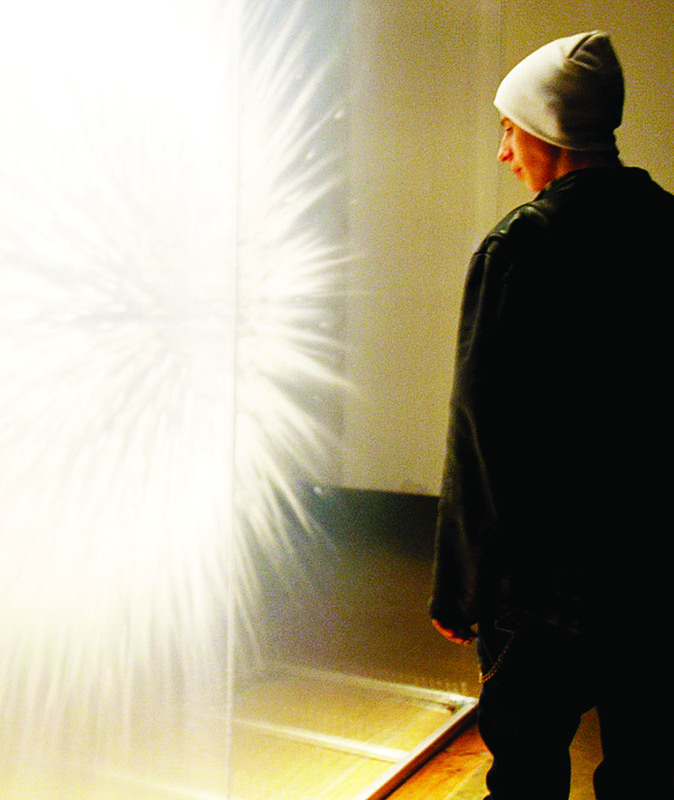 Destruction, beauty, time and space are all viewed as visitors walk through the Kitchener-Waterloo Art Gallery for the Walk the Talk exhibition held. With two parts to the exhibition, Karoline Varin-Jarkowski, artist educator, guides her first one-hour tour explaining each artist’s collection. The first part of the tour is on their permanent collection called We All Fall Down curated by Barbara Hobot and Cindy Wayvon. The second part of the tour, called The Limits, shows visitors that art has no limits and the universe is ours for the taking. Varin-Jarkowski said the permanent collection presents images of destruction and decay, that there are things that may be unsettling, but still have beauty behind them. She points to a drawing by Paul Fournier called the Dead Crow to show that even a drawing of an upside down crow decaying can still be beautiful as it depicts beauty through the lines and actual art itself. “As humans, we have this tendency to get interested in the grotesque or ugliness which almost goes with beauty,” she said. A prime example of this is photographs by Edward Burtynsky of a chicken processing plant in Toronto and a B.C. packaging plant in British Columbia. He is interested in how humans have an impact on the environment, Varin-Jarkowski said. A lot of his work has to do with sites and factories in China and the cutting down of forests. The way he photographs shows a lot of elements, composition and design. “It makes you think how we as a society have to survive and have to eat, but also realize what it does to the food chain and how we deal with food and the raising of animals for food and science,” said Varin-Jarkowski. Visitors walk past a piece of art that looks like it is burning. The orange, red and yellow flames capture visitors’ attention, leaving them pondering what the photo is about. “Artist Michael Snow created a piece he calls Smoke and Mirror that starts as a painted self-portrait that the artist photographs then lit on fire. As the image burns he re-photographs the work which shows destruction. It’s quite beautiful in the way it is shown,” she said. As people stroll onto the next part of the exhibition, Varin-Jarkowski said Crystal Mowry started the whole process of curating the exhibition two years ago by interviewing all the artists, getting their work to the gallery and had some artists speak at opening receptions. She wanted to work with the concept of time, space, limit and also memories through passage of time. Spring Hurlbut, an artist who is interested in memory, has worked with human and animal remains. Varin-Jarkowski said it started with her father. When he died and was cremated, Hurlbut took his ashes and used it as her way of dealing with his death. Hurlbut spilled the ashes on black felt and photographed the patterns. Varin-Jarkowski stresses that people may find it a little unsettling, but said it is interesting how it can remind someone of the cosmos, of space, of being born as part of the universe and when they die they are also a part of the universe. “When I die I would love for someone to do this. Some people may think it is morbid, but I don’t at all. I think it has to do with your background, your religion and so on,” Varin-Jarkowski said. Born in the Philippines, Lani Maestro creates a 500-page book called a Book Thick of Ocean which represents endless pages of ocean waves. This is a visual reminder of the physical and historical distance which separates Maestro from her own life. The Drawing of the History of the First World War by Kristan Horton uses a variety of media, such as sculpture, video, photography and drawings. By choosing an event in history, the scale of production and redefinition was prominently shown in each of the eight drawings, said Varin-Jarkowski. The artwork is presented in a spiral manner because the artist does not want people to stand and just look at the art on the wall, but wants them to take the time to walk around the piece to engage in every detailed event drawn. In the next room, David Spriggs’s art Vision and Archeology of Space is influenced by the Renaissance era and early cinema. 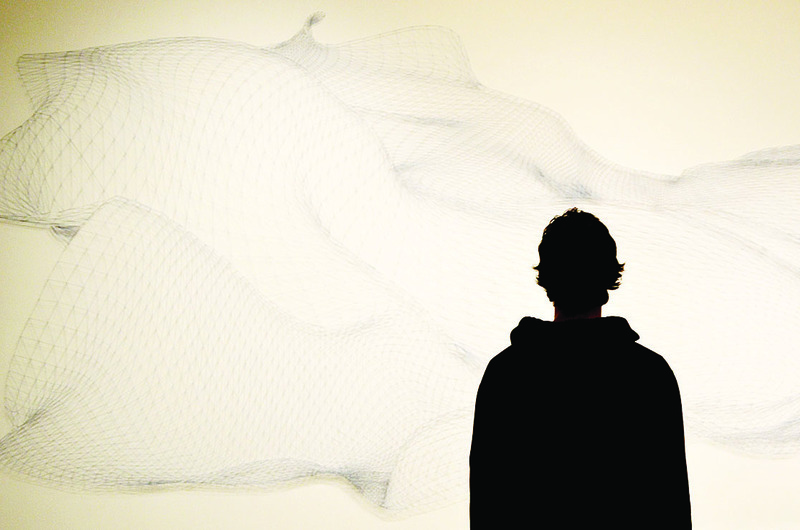 His layered sculptures are done on transparent film using a digital computer program. He then uses acrylic paint and light to trigger his illusion. “This is the same idea where you can walk around it and the image is distorted, but it is also very spatial. This reminds people of a cosmo explosion. It’s like it is changing the shape of space and concept, but the figure actually looks three dimensional,” said Varin-Jarkowski. Last, but not least, Jani Ruscica creates a video to tell a collective story of the evolution of the universe through the perspectives of seven Finnish youth. The video, called Evolutions, portrays each youth’s narrative version of how they view the world up until this point. “The chalk is symbolic of drawing boundaries, of depicting time, the idea of limits and so on. The video is spoken in Finnish and then translated into English. The photographs, called Microcosm, depict each youth in their own tangible universe, also known as their bedrooms,’’ Varin-Jarkowski said. As the video finished, so did the exhibition. Destruction, beauty, time and space came to an end, but the art will still be shown at the gallery until Jan. 8. Upcoming exhibitions include Marc Ngui and Magda Wojtyra: Let’s Glow, starting Jan. 18 and Another Victory over the Sun starting Jan. 20. Grant Henderson took his time begfore the symphony to appreciate the string artwork done by Alyson Shotz.